Most recently, a young Belgian homeopath asked ne how to get more aot of the Repertory. I suggested she slowly read through the Delusion rubrics, making sure to understand each one. The Delusion rubrics are treasures which need to be unlocked. Some homeopaths dismiss them altogether as delusions which are too difficult to understand, or too difficult to rely upon. Liz Lalor has come up with a most interesting concept to not only understand these critical rubrics but to effectively use them in practice. I am proud that she prefers using our team´s work to do so. When editing the repertory, we have spent much time to remain faithful to the source texts. These efforts are complementary to the wisdom and work, generously explained in Liz´s book. 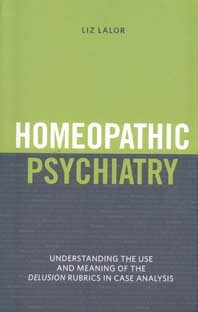 I trust that the reader of Homeopathic Psychiatry will find the repertory to be an even more accurate tool. Dr Frederik Schroyens Chief Architect of the Synthesis Repertory and Homeopathic coordinator of the Radar Radaropus Radarhomeopatía project..
Liz Lalor brings to her teaching thirty years of clinical experience in counseling and somatic psychotherapy. The purpose of understanding psychological stages is to match the simillimum to the psychological presentation of your patient's delusional state. Her psychological insight into the mental and emotional disturbance in patients suffering chronic disease has been the catalyst to her ground breaking lectures and seminars. In 2008 Liz Lalor presented a series of lectures on her video cases in a lecture series called "Revealing the Disturbance in the Case" in UK, Belgium and the Netherlands. Her psychological insight into the mental and emotional disturbance in patients suffering with chronic disease has been the catalyst to this groundbreaking understanding of the Delusion rubrics. Homeopathic Psychiatry is not only a great addition to understanding case-taking techniques it is an extensive Materia Medica study of the meaning and application of the Delusion rubrics. It's a Materia Medica study of the psychotherapeutic application of the NEED for the psychological delusions within each of the constitutional remedy profiles. This Materia Medica greatly expands our understanding of destructive pathology within the simillimum, transforming case-repertorisation. Liz Lalor has taken homeopathic rubric-repertorisation and traditional counselling techniques, and combined the two to create an invaluable case-taking manual. In 2008 Lalor presented a series of lectures on her video cases in a lecture series called ‘Revealing the Disturbance in the Case’, in London, Belgium, and the Netherlands. Her psychological insight into the mental and emotional disturbance in patients suffering with chronic disease has been the catalyst to this groundbreaking understanding of the Delusion rubrics. Homeopathic Psychiatry is not only a great addition to understanding case-taking techniques it is an extensive Materia medica study of the meaning and application of the Delusion rubrics. Lalor’s model teaches homeopaths how to follow the five psychological steps that the patient will move through in a homeopathic consultation as they struggle to acknowledge their loss of good health. This book is an extensive, previously unexplored explanation of the meaning of each individual Delusion rubrics. The individual psychiatric interpretation of each Delusion rubric is an invaluable guide to understanding these previously misunderstood and underutilized rubrics in our repertory. Lalor presents several cases from her practice. In each case analysis, Lalor clearly defines the four necessary requirements for the use of the Delusion rubrics in a patient’s case analysis, and unravels the significant events to give an explanation of the causation within the case, and an explanation of her rubric-repertorisation technique.